It has gotten pretty cool here in NY, and I found myself without enough handknitted socks to keep my feet warm, so I dug out both pairs of unfinished socks I’d brought with me, and within the week I completed both pairs and now have much warmer feet! 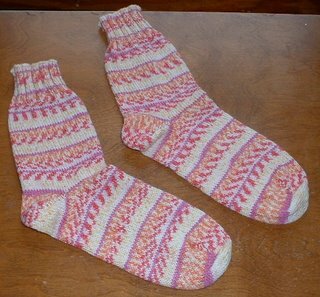 The first pair, made of Sockotta, I had started back in May, completing one sock and occasionally knitting on the other throughout the summer (Why is it so hard to get that second sock done?) I had gotten up to the ribbing and in one sitting finished it off early in the week. Here is the completed pair. I can’t remember the colorway, and I lost the ball band; I think it was something like “fruit stripe.” They were made toe-up, with yarn-over short-row heels and toes, and 3x3 ribbing at the top. I also started the second pair back in the spring and completed only one. I began the second one on Tuesday and finished it last night. This is a record for me; cold feet kept me motivated! 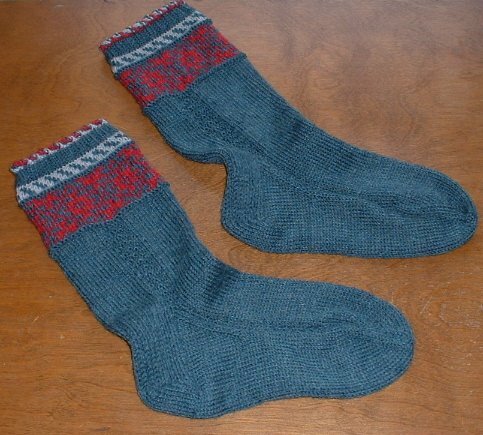 The pattern is from Nancy Bush’s Knitting on the Road, and it is knitted with Kroy Socks in retro red, whitecap, and shaded spruce. If you look at the picture long enough, you can see that in the second sock I initially forgot which was color was CC1 and which was CC2 and therefore got the twisted part above the ribbing backward. I noticed it fairly early on, but decided it didn’t matter to me, and time was of the essence. In closing, here are my festival purchases from last weekend. 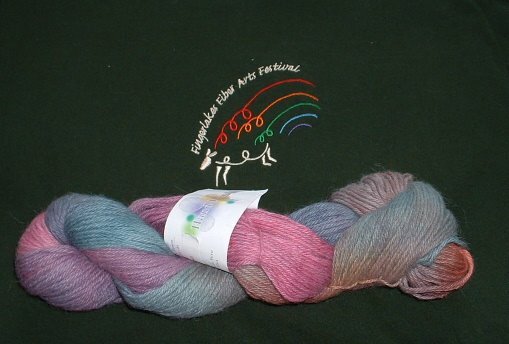 The yarn is a beautiful handpainted alpaca from The Alpaca Yarn Company that I got from the Golden Oak Farm booth. The Golden Oak Farm is located in Honeoye, NY, and we drove by it while taking the scenic route home from Hemlock. 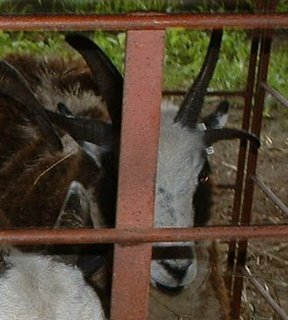 They are having an open house in a couple of weeks, and we plan on driving back down if the weather is nice. 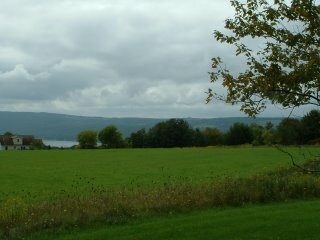 It is a beautiful area--here's one last pic of a slice of Honeoye Lake. Hello. Long time no blog, I know. I have no excuse other than that I simply lost interest in updating. However, the weather has turned cool, and the lake is churning, so my thoughts are turning to warm things, like the lemon tea I have by my side, and the unfinished wool/cotton socks in my knitting bag. 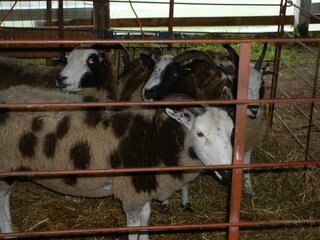 On Saturday CP and I went to the Finger Lakes Fiber Festival down in Hemlock, NY. We had a great time, in spite of tricky navigation, both by car and by foot, in the ankle-deep mud in the fairgrounds parking lot. One woman drove past just after we parked and yelled out the window at people at the bottom of the slope, "Get out of the way! I don't think I can stop! ", but she did just fine. The mud didn't slow anyone down; it takes more than that to turn back fiber nuts! I made many new friends, mostly of the four-legged, fiber-covered variety. 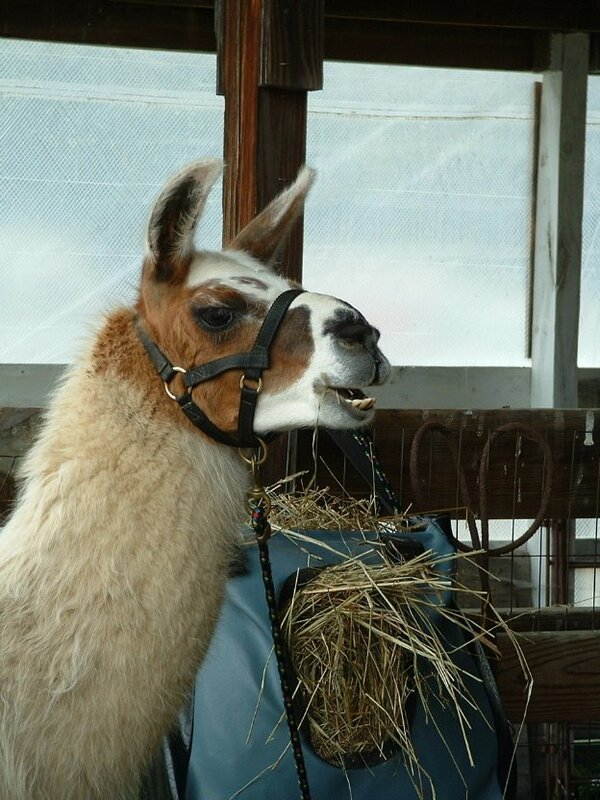 Here's a grinning alpaca with the same haircut that I got last summer. I don't go to that salon anymore, but on her it's pretty cute. 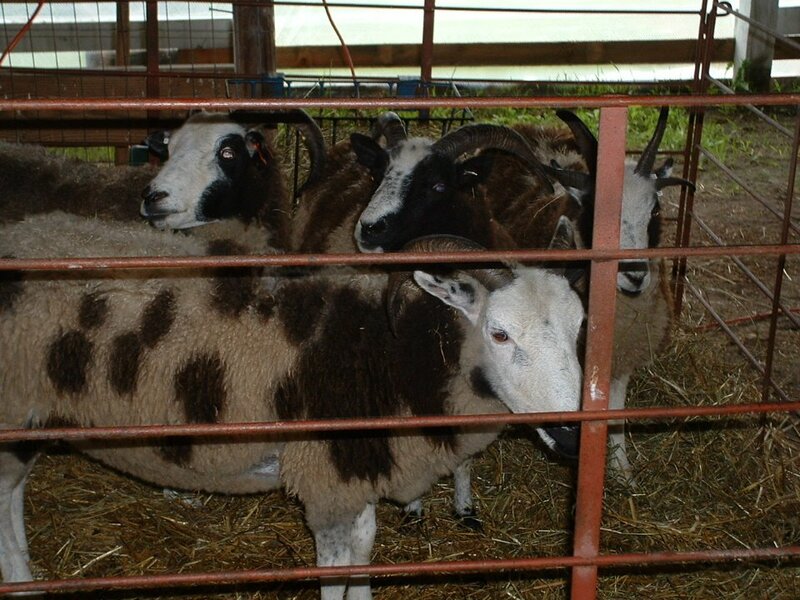 A few Jacob sheep, a breed I'd never heard of but found interesting for their spots (and therefore the lovely tan/brown mix of the processed fiber) and for the fact that they can grow up to six horns. Here's a close-up of the ewe on the right; she looks a little like she's sporting the Statue of Liberty's crown. 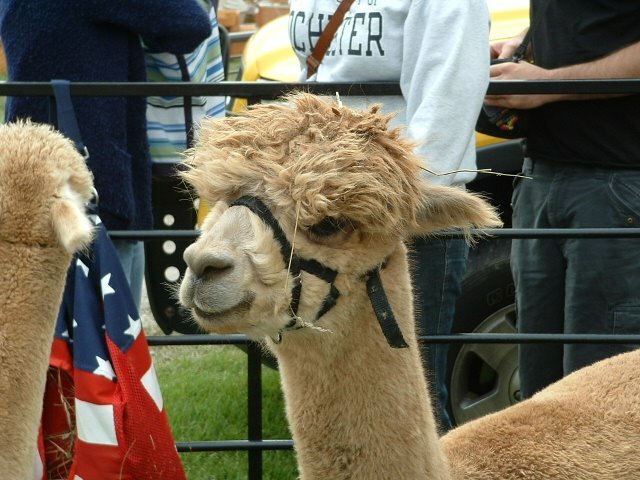 The sole llama I saw. This guy didn't look too friendly, though later I saw some kids petting him with the help of the llama's owner. Maybe he was just hungry. 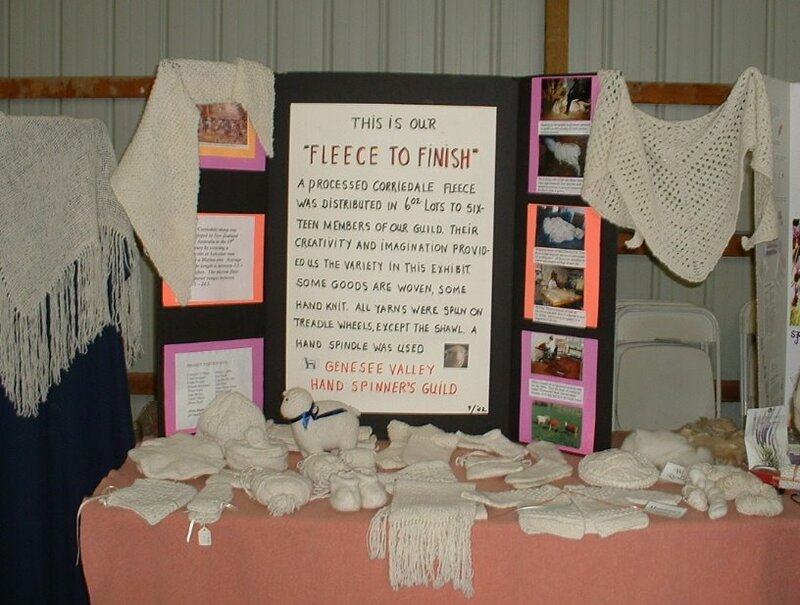 I really loved this display--several members of the Genesee Valley Hand Spinners Guild were given six ounces of a processed Corriedale fleece, and they had to spin it, ply it, and then make it into something. Look at all the great items! 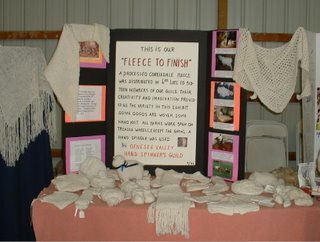 There was so much to look at; it was truly a knitter's and spinner's paradise. Although I don't spin (yet), I was transfixed by all the beautiful hand spindles, especially those made of exotic woods. In spite of all the beautiful yarns, I only bought one skein of 100% alpaca, hand painted, that I plan to make into mittens. I also got a t-shirt, of course. I'll post pics of those later.